The Bicentennial National Trail follows historic coach and stock routes, old pack horse trails, mail runs and country roads for over 5000 kilometres through Queensland, New South Wales, Victoria and the ACT. Wherever possible, along its great length, the Trail provides a living history of our country, following the routes of early pioneers and highlighting historic and heritage sites and artifacts along the way. As it winds along Australia’s eastern seaboard the Trail reveals some of the most spectacular scenery in the country. It traverses lush tropical rainforests, rugged mountains, valleys and gorges, remote dry plains, alpine meadows, snowfields and wilderness. The Trail provides access to some of the wildest, most inaccessible country in the world and provides endless fascination for those interested in Australia’s unique fauna and flora. 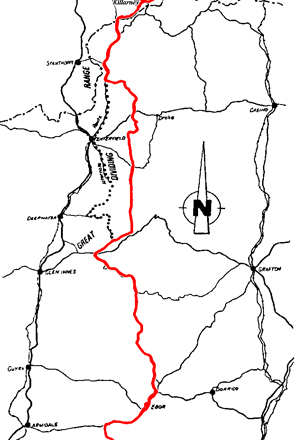 The Bicentennial National Trail was originally conceived as a route for the long distance horse trekker but is now enjoyed by cyclists and walkers as well. It is not always possible to traverse the whole route, or even a large part of it, in a single journey! Select a short section that attracts your interest and start there. The Trail is presented in 12 Guidebooks covering sections of 400 to 500 kilometres each. An overview of each section is provided here. For detailed information it is best to obtain a Guidebook from our shop. We also have some general information on planning a trek and answers to some frequently asked questions. Take some time to discover the magic of the BNT! A comprehensive set of Guidebooks covers the full length of the Bicentennial National Trail. A Guidebook is a ‘must have’ for anyone considering travelling on the BNT. See Discover the BNT for general information on each section and upates. The Bicentennial National Trail is an entirely voluntary organisation and we raise most of our funds through memberships and the sale of guidebooks. Many people assume that we have some form of recurrent government funding or corporate sponsorship – we don’t. Many similar iconic trails are owned and maintained by government agencies. Our situation is different. 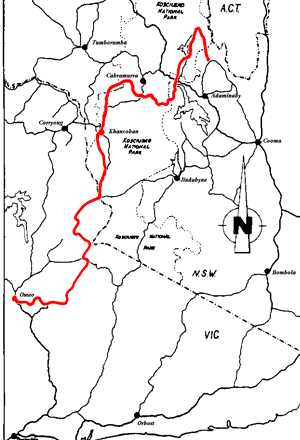 We do not control the land over which the trail passes, rather we possess the intellectual property which provides the uninterrupted 5330 km trekking route in eastern Australia that is the Bicentennial National Trail. We rely on the good graces of the many land owners and land managers over which the Trial passes – across three states and the ACT and in particular we seek to protect the interests of the private land owners who make their property accessible to long distance trekkers. We do have to restrict the availability of Guidebooks to BNT members only, due to our insurance commitments. We ask that you join the BNT to access to this iconic Trail. Some of the benefits of BNT membership include access to the Guidebooks and access to the vast network of section coordinators and ‘Trail Angels’ who freely give support and advice to trekkers. In our experience the ‘Trail magic’ that happens along the route is the added bonus that BNT members find on their travels. 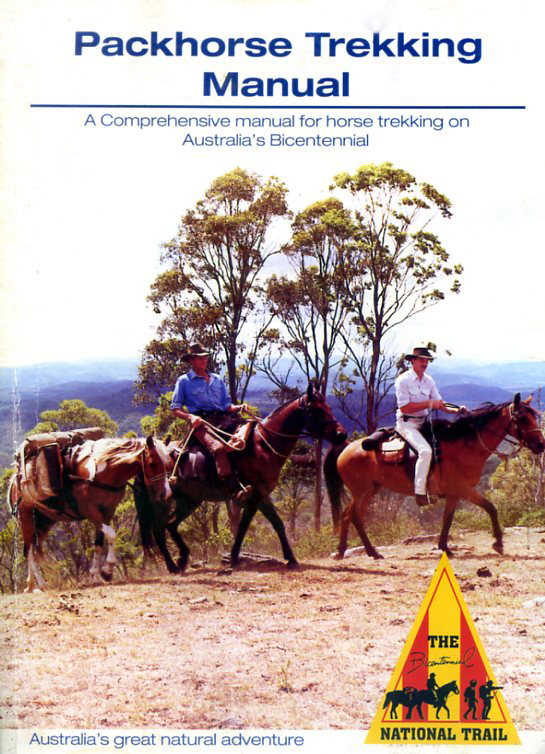 Guidebooks one to six cover the Trail in Queensland. History and tropical beauty come together in this very demanding and remote section which begins in Cooktown exactly where Captain Cook beached Endeavour in 1770. 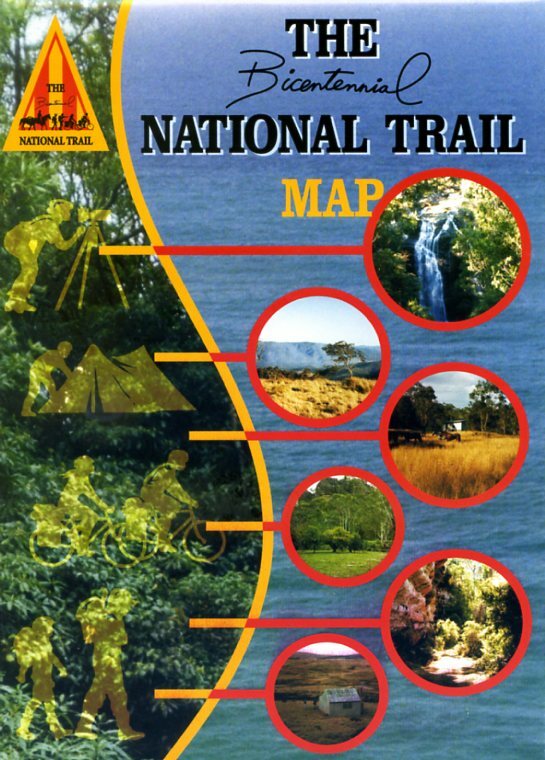 The Trail heads south from Cooktown through the tropical rainforests of Cedar Bay National Park to Daintree and Mossman before turning west into an area which, in stark contrast to the coastal areas, is harsh and dry. The dry season (April – October) is recommended for travel as many rivers and creeks are impassable during the wet. Crocodiles are a danger and water can be elusive inland. The Trail is closed at Maps 10, 11 and 12 for realignment. Challenging. Parts of this section are challenging and should not be travelled alone. Humid tropical – hot , humid summer, warm winter in coastal areas. Tropical cyclones may be expected during the wet season. Tropical savanna – hot, dry summer, warm winter in inland areas. Summer conditions extreme, trekking not recommended. Break camp early and avoid travel during the heat of the early afternoon. Ranges from quite easy to extremely difficult. Mostly not suitable for bicycles or horsedrawn vehicles. Compass and topographic map essential for maps 11 and 12. Water can be difficult in the dry season. Water must be carried in some parts. Water conservation measures necessary. The best time for travel is as soon as possible after the wet season (April/May) to capitalise on surface water and natural feed for the first 800 km. Long-distance trekkers should plan their departures from Cooktown so that they can be south of Townsville before September otherwise heat and lack of water make travelling too stressful on humans and animals. Horses coming from anywhere south of Rockhampton will need time to aclimatise to the extreme conditions. Horses should be given a couple of weeks to adjust to the heat before starting out. Consideration could be given to obtaining local horses as they are accustomed to the extreme climate. Parts of this section are remote and rugged and unsuitable for cyclists. Refer to Guidebook notes for alternative road routes to bypass these sections. Expect hot, dry conditions in summer. Passing through vast remote cattle stations in the steps of our pioneers, travellers develop a special fondness for this isolated section of the Trail. 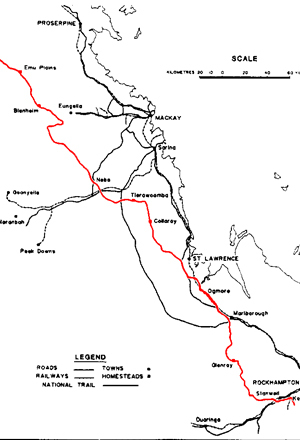 It follows lonely roads along the wide stock routes to the ghost town of Ravenswood, and the massive Burdekin Dam, then follows the rivers to Collinsville, a large inland mining town. This section is mostly easy flat travelling but extreme care should be taken in the wet season when most rivers flood and flash flooding is common and in dry conditions when feed and water may not be available. Advanced. Not suitable for novices. Humid tropical – hot, humid summer, warm winter in coastal areas. Tropical cyclones may be expected during the summer wet season. Tropical savannah – hot, dry summer, warm winter in inland areas. Summer travel is not recommended. Break camp early and avoid travel during the heat of the early afternoon. Drought may affect this section. During drought conditions there may not be water or feed for horses. Floods may affect this section. Always check conditions before travelling. Varies from flat to undulating with no steep climbs. Travel by mountain bike and horsedrawn vehicles is feasible. Route is entirely along (sometimes barely) trafficable roads. Water may be scarce during the dry season. Each day’s travel is planned not so much on distance but on availability of water. During drought conditions, water may not be readily available. Dams may be dry and parts of this section will have no surface water. Trekking through this section is usually best in the cooler months between May (if the rivers aren’t still flooded) and August. Much of this area does not have reliable mobile phone coverage. Trekkers should plan on making contact with Section Coordinators and land owners from a town. Landowners should always be contacted before attempting this section. Trekkers on this section must be self-reliant and be prepared to carry all necessary feed, water, equipment and safety devices. All traversable by mountain bike and recommended. 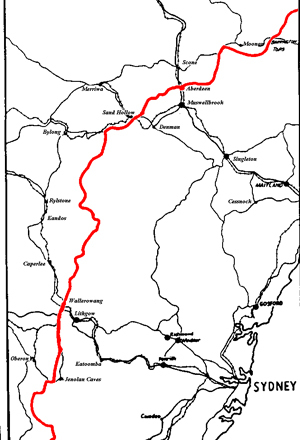 Still following the inland rivers, the Trail heads to Eungella Dam and Nebo before joining the little used wagon road over Connors Range to the coast at St. Lawrence. 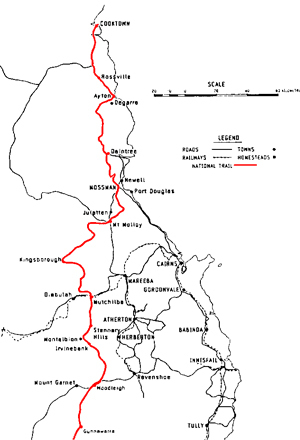 The Trail crosses the coastal saline flats before heading inland along another old stock route that follows the Fitzroy River west of Rockhampton. This section is more closely settled with travelling suited to most forms of travel. Crocodiles have been sighted as far south as the Fitzroy River. Moderate. Recommended for experienced trekkers only. Hot, humid summer, warm winter in coastal areas. Hot, dry summer, warm winter in inland areas. Nights may be cool in winter. Break camp early and avoid travel during the heat of the early afternoon. Best time to travel is April through to November. 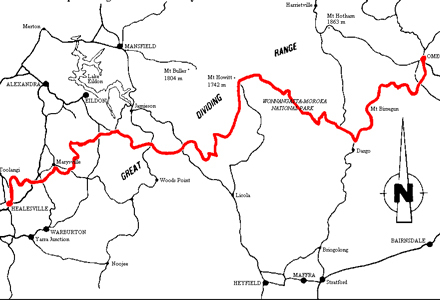 Significant climbs at Eungella Dam (Map 5) and Connors Range (Maps 12 & 13). Remainder flat to undulating. Generally adequate during the wet and early part of the dry season. The best time to travel this section is from about April through November although rainfall (or lack of it) may dictate a shorter trekking season. Grass and water are usually abundant in the early parts of the dry season, becoming scarcer towards the end of August. Availability after August depends on more rain. Just south of Collinsville the Trail crosses the Bowen River with a minor obstacle to bicycles when the water level is low. Cyclists should detour around the Connors Range, west of St Lawrence, rather than attempt the very rough track. The rest of this section is suitable for mountain bikes. Much of this section is through rugged, often dry terrain but the hardships are richly rewarded. After leaving the National Trust classified town of Mt. Morgan, the Trail follows the Don River to its head in the Calliope Ranges, past Biloela and into the seemingly impenetrable wilderness of the Kroombit Tops. Rainforest and rare native fauna occupy the massive gorges. Beyond Monto the terrain eases as the Trail follows roads and tracks to Mt. Perry then through the Goodnight Scrub to the Burnett River, a favourite of canoeists. Subtropical, with a warm humid summer. This agreeable climate allows year-round enjoyment. Varies from easy well-watered country to parts which should only be tackled by fit and experienced trekkers. Not much is suitable for mountain bikes or horsedrawn vehicles. Shortage can be a seasonal problem – seek local information. 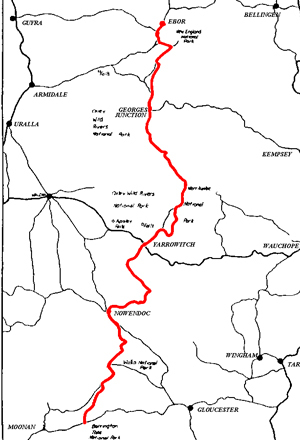 Route passes permanent water at least once each day. Summer temperatures in mid to high thirties with warm nights. Winter days typically dry and sunny around 20 degrees C, but nights can be frosty. Early winter is probably the best time to travel. Most rainfall is between December and March, when flooded creeks may close parts of the route. Travel at night, or break camp early and avoid travel during the heat of the early afternoon. Cyclists using the Trail can access the Trail with public transport at Kabra, Bouldercombe and Mt Morgan. Some sections are best detoured. In some places, care is needed with loaded bikes. In this area the Trail is mostly through forests along the coastal ranges. 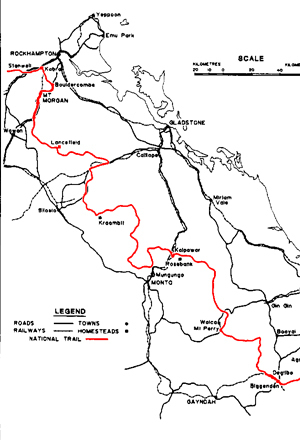 Many of the roads and tracks are the original pioneer routes. The alluvial goldfield just south of Nanango will reward most amateur fossickers, so a gold panning dish is recommended luggage. Introduced red deer may be spotted along with many other species of wildlife and this part of the Trail is well suited to family trips any time of year. Not particularly rugged although there are a few climbs which will exercise the lungs. Water is generally available at each overnight camp and usually throughout the day from creeks, dams and windmills but some water should be carried, particularly in mid-summer. Relatively populated. Ideal for shorter treks. Mostly excellent for mountain bikes. Biggenden to Kilkivan the Trail mostly passes through farming land interspersed with Forestry portions so there are many access points at fairly frequent intervals. There are a couple of steep climbs which are manageable on bikes but heavily loaded bikes may find it difficult. If required, through trekkers can avoid these by detouring along local roads – details in the Guidebook and Trail Updates. A pleasant mix of forests and farmland, the Trail here follows the foothills of the Great Dividing Range and passes just to the east of Toowoomba. 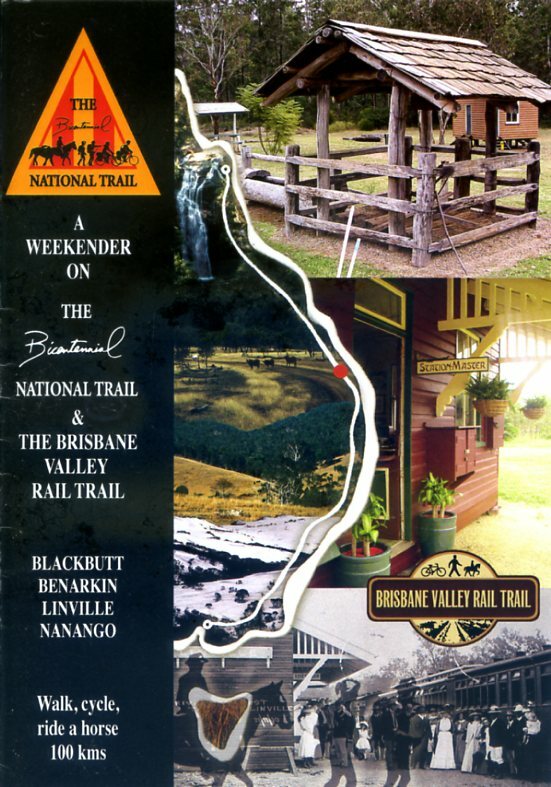 The BNT links to the Brisbane Valley Rail Trail at Blackbutt. South of Ravensbourne the Trail is mostly along quiet roads which makes it safe for adventurous youngsters. 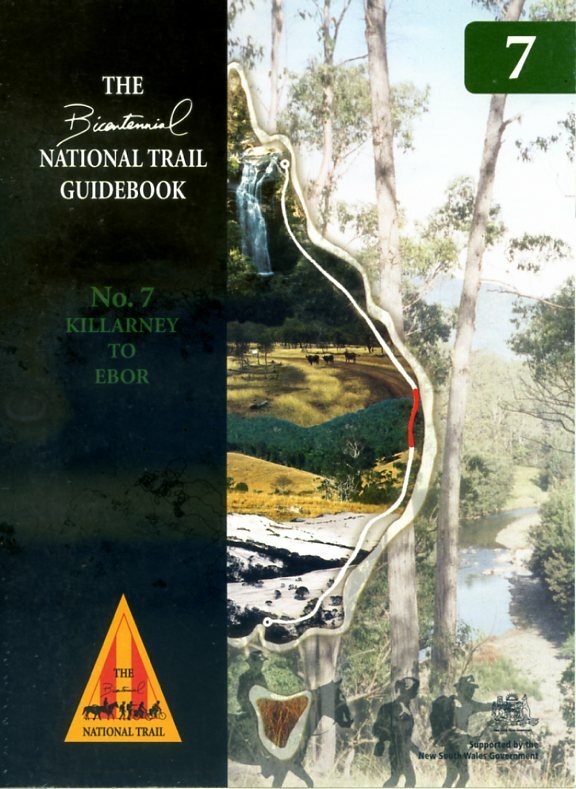 The Guidebook 6 trail notes cover the Trail between Blackbutt and Killarney. The higher parts offer magnificent views and a great variety of fauna and flora, particularly in Ravensbourne National Park. Temperate – warm summer, cool winter. Southern Queensland enjoys a near-perfect climate that makes this section of the Trail ideal for travel throughout the year. In winter some of the higher parts can be cool with occasional frosts but generally pleasant daytime temperatures can be expected in winter. None of the Trail through this section is particularly difficult. It passes through a mixture of rough bushland and settled grazing/agricultural areas, and mostly follows along the foothills of the Great Dividing Range but climbs the range just south of Toowoomba and again near the border. The PDF version of the Trail Notes is usually sufficient. Stock water is Usually ample. Walkers and particularly cyclists should in warmer weather be sure to carry adequate water because of the generally hilly nature of this section. If travelling south with pack animals it is a legal requirement that all horses and pack animals be inspected and treated prior to leaving Queensland to prevent the spread of cattle tick. 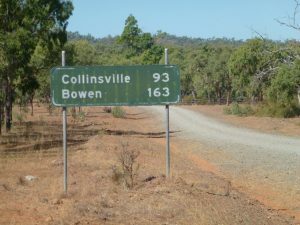 This requirement applies to animals heading south from Queensland into New South Wales (See Guidebook 7 Map 1) as well as animals travelling west of the Trail (eg Toowoomba). Refer to the Guidebook for details or check with Section Coordinators. Information on owner responsibilities can be obtained from the Department of Agriculture and Fisheries website. Trekkers with horses entering Queensland from New South Wales should vaccinate horses against Hendra Virus, if this has not already been done. Additional information on Hendra Virus can be found here . This section traverses rugged remote country just east of the Great Dividing Range, following the Demon Fault Line. The route is well watered but long climbs require a high level of fitness in walkers, riders and horses. There is a great variety of scenery and access to several national parks including Bald Rock, Gibralter Range and the rainforest wilderness of Walshpool National Park is nearby. A special feature is the most remote part of the Trail, following the Guy Fawkes River through the Guy Fawkes National Park. The higher parts can be bitterly cold in winter and the best time is after the spring rains. There are no facilities on the Trail between Killarney and Ebor, although access is readily available to nearby towns. Challenging. This section should not be travelled alone. Temperate – warm summer, cool winter. The higher parts, particularly around Ebor, may experience snow in winter but in the valleys it is much milder. The reverse applies in summer with the valleys hot, but pleasantly mild at higher altitudes. Avoid travelling in the heat of the day. This section of the Trail traverses rugged remote country just east of the Great Dividing Range, following the Demon Fault line. There are some very challenging steep climbs requiring some level of fitness in travellers. Carry a map and compass and know how to use them. There are no facilities on the Trail between Killarney and Ebor so trekkers must be prepared to be self sufficient for this entire section. Winter frosts burn off the grass so horse travel is best done after early spring rains raise new growth. Much of this section follows travelling stock reserves (TSR). Most campsites are on TSRs where Permits are required for camping. 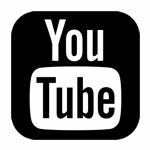 See the downloads page for more information. The mountainous terrain makes almost all of this section difficult for mountain bikes. If you are very determined and prepared for much carrying and pushing of your bike it is possible to follow the Trail but most will find the Timbarra (Rocky) River and the Guy Fawkes River far too difficult and time consuming. The Trail through this part traverses wild country half way between the New England Highway and the coast. 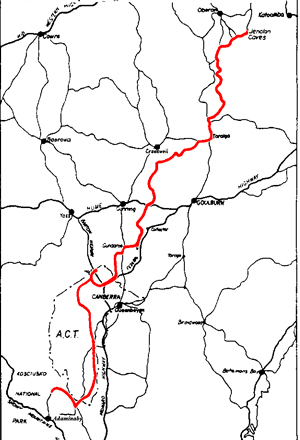 It is clear from looking at a road map that there are no roads heading north-south through this part of the country and those with little time may prefer to avoid this whole section by following the New England Highway from Tenterfield through Glen Innes to Armidale on the western side of the Trail. Alternative routes for cyclists are contained in the Guidebook and Route Updates. Weeds are also a problem in this section and are often in excess of two metres high, blocking all vision of the surroundings and Trail. Rugged and remote, the Trail here follows the rivers and gorges of the Demon Fault line, picks up the historic stock route through Nowendoc then climbs through the forests into Barrington Tops. 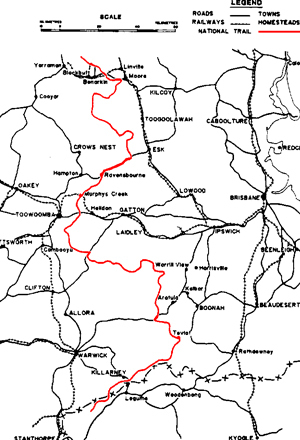 Much of this section is State Forest or National Park and includes Oxley Wild Rivers, Werrikimbe, Woko (World Heritage listed) and Barrington Tops National Parks. At 1600 metres, the Barrington Tops is an area of breathtaking beauty with snowgums, snowgrass and snow in winter. Even in summer both extremes of weather can be experienced at the higher altitudes. There is unlimited scope for walking and horse riding in this region but provisions are only available at the very small villages of Ebor and Nowendoc. Temperate – warm summer, cool winter. The higher parts, particularly Ebor and the Barrington Tops, occasionally experience snow in winter but in the valleys it is much milder. The reverse applies in summer with the valleys hot, but pleasantly mild at higher altitudes. On the Barrington Tops snow is a possibility any day of the year and the change in weather can be very rapid and dramatic. Summer days on the Tops are usually dry and mild but the nights still get cool. Avoid travelling in the heat of the day. Steep and remote. Not suitable for horsedrawn vehicles. Many trekkers, especially in the cooler months, bypass the Barrington Tops taking the easier (and warmer) route along the quiet roads around the northern and western sides, and linking into the stock route systems of the Hunter Valley. Extreme care should be taken with river crossings and flash flooding can occur following rain upstream. The mountainous terrain makes almost all of this section very difficult for mountain bikes. If you are very determined and prepared for much carrying and pushing of your bike it is possible to follow the Trail but most will find this far too difficult and time consuming. The Trail through this part traverses wild country between the New England Highway and the coast. 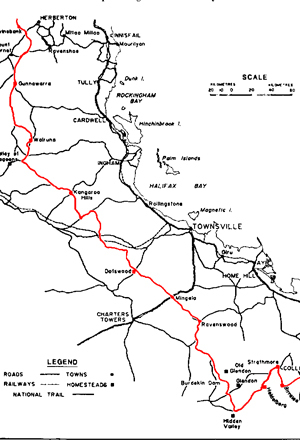 It is clear from looking at a road map that there are no roads heading north-south through this part of the country and those with little time may prefer to avoid this whole section by following the New England Highway on the western side of the Trail. Alternative routes for cyclists are contained in the Guidebook and Route Updates. This section takes you across the Barrington Tops then crosses the rich plains of the Upper Hunter Valley, breeding centre of Australia’s horse industry. Following quiet roads and historic stock routes, the Trail leads to the top of the Great Dividing Range and along the vast wilderness of the Wollemi and Blue Mountain National Parks. Despite its rugged grandeur, this section of the Trail is quite safe for first time adventurers to tackle with confidence. Several campsites are in established areas with hot water and electricity and the unforgettable Jenolan Caves are only a short distance off the Trail. Both mid-summer and mid-winter are best avoided for their extremes of temperature. Temperate – warm summer, cool winter. This latitude typically has a pleasant climate but at higher altitudes it may be several degrees cooler. Winter snow and sleet along the ranges are not uncommon so travel is recommended in the warmer months. The only difficult climb is at Mt Barrington (900 m in 7.5 km), but apart from that there are only a few short sharp climbs so high levels of fitness are not necessary, as long as you take it easy. From Rydal south this section is suitable for horsedrawn vehicles, with short detours around only a few tricky parts. Mountain bike riders will find all except the descent of Mt Barrington to be very worthwhile. Spring, early summer and autumn are the best times to travel on this part of the Trail. Avoid winter which is often wet and cold, and midsummer if it has been very dry. Parts of this section follows travelling stock reserves (TSR). Campsites on TSRs require Permits for overnight stays. 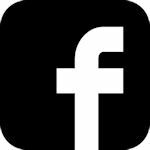 See the downloads page for more information. There are some steep challenges in this section but many are well worth the effort. To avoid these challenges detours are recommended. See the Guidebookk and Trail notes for details. The Trail traverses the southern highlands of New South Wales, and the fine wool growing districts. This is an historic area, first settled around 1820. 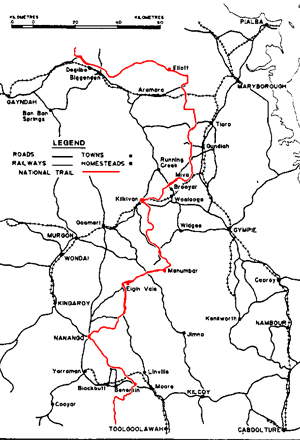 Passing through Taralga and Gundaroo, the BNT follows the equestrian trail system through the Australian Capital Territory around Canberra’s outer suburbs before heading into Namadgi National Park and crossing into Kosciusko National Park. Travel is advised in milder months. Total fire bans often apply January to March. Most of this part of the Trail is suited to horse drawn vehicles. Moderate. This section is not remote like much of the Trail. It can be approached with some degree of confidence by inexperienced trekkers. Cool temperate – mild, warm summer, cold winter. Summers are generally warm and dry with occasional heatwaves in mid-summer. Winter is cold and produces cold gusty winds with occasional sleet and snow that doesn’t make for pleasant travel. Most this section is suitable for mountain bikes and horsedrawn vehicles. Summer heatwaves should not be taken lightly. This entire section has been enjoyed by many cyclists and is considered ideal for mountain bike touring. Here the Trail crosses the vast alpine playground of Kosciusko National Park, the land of mountain horsemen, wildflowers and snow gums. The Trail connects with the Alpine Walking Track which offers walkers an alternate route through Victoria. The National Trail in Victoria accesses the lesser known, remote rugged areas, part of the huge Australian Alps National Park. Challenging. The more remote areas are recommended for competent, fit travellers and the going is often steep. This section should not be travelled alone. Cool temperate – mild, warm summer, cold winter. Snow is a possibility at any time, and the change in the weather can be very rapid and dramatic. Even in summer you should be prepared for both extremes of temperature, including severe heatwaves when it is too hot for trekking. For days on end it is not unusual to be in shorts at lunchtime and wrapped in everything you have after dark. This part of the Trail is closed by snow in winter, and snowfalls can occur even in summer. Ski tourers will enjoy the Trail in winter, for others the best time is October to April. Special fire precautions apply January to March. Rugged and remote, with long steep climbs. Travellers should not underestimate how tough this section is, both on themselves and pack animals, especially in Victoria. Topographic maps should be obtained . Use of a compass is necessary. Unexpected detours may be required. Availability decreases as the dry summer progresses. Expect difficulty finding water in some areas, especially later in summer. There are no sources of provisions between Khancoban and Omeo. Parts of this section are closed over winter from 15 June to 31 October. This section is not pleasant in winter so plan for trips from November through mid-April. Water and grass availability decrease as summer progresses. The Trail in Victoria is nearly all a series of long steep stony climbs either up or down. Cyclists may prefer to take alternative road routes which are detailed in Guidebooks and Trail Updates. Almost entirely within forests and National Park, the Trail offers a rich variety of scenery from dense forests to trout-filled rivers and sub-alpine meadows. Rich in history too, this part of the Trail encounters the sites of many old gold towns and pioneer settlements. This is big, rugged country and its challenges should not be underestimated although the first five days from Healesville are relatively easy. Travel October to April, and be ready for total fire bans in mid summer. 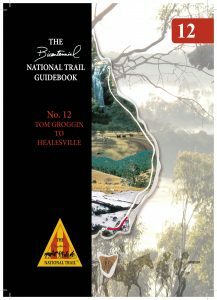 The southern trailhead is at Healesville, a pretty town nestled among green hills just 60 kilometres north-east of Melbourne. Challenging. It is suitable only for fit and experienced travellers. This section should not be travelled alone. Cool temperate – mild, warm summer, cold winter. The altitude of the National Trail in Victoria is mostly in the 800 m – 1300 m range. Snow is a possibility on any day of the year, and a change in weather can be very rapid and dramatic, with temperature falls of up to 20 degrees C in just a few minutes. Even in summer you should be prepared for extremes of temperature. Summer days are usually dry and mild with cool nights however heatwaves occur occasionally and these can be severe. Special fire precautions should be taken January to March. The first few days out of Healesville are relatively gentle, especially if the first climb out of Healesville is bypassed. However, once the Big River is reached a very steep climb over Mt Terrible marks the end of the easy terrain. Most of the remainder of this section is over big, rugged, steep and remote country. It is not feasible for horsedrawn vehicles to follow much of the Trail in Victoria and the steepness excludes all but the most determined mountain bike riders. Sections of the Trail are closed (with locked gates) by the Department of Conservation and Environment in winter so be sure to plan trips between October and mid April. This is important for there is too great a risk of being caught in bad weather outside this period. The steepness excludes all but the most determined mountain bike riders. The Bicentennial National Trail is suitable for weekend family excursions as well as longer trips. 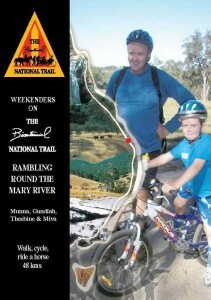 We have a series of booklets, called Weekenders, which provide a taste of life on the Trail. Weekenders can be purchased by clicking the link below or from visitor information centres in nearby towns. Paradise Dam: walk, cycle or ride 23km and 26km. Kilkivan to Woolooga: walk, cycle or ride 35km. Brisbane Valley Rail Trail: walk, cycle or ride 100km. We hope to extend the number of Weekenders over time. 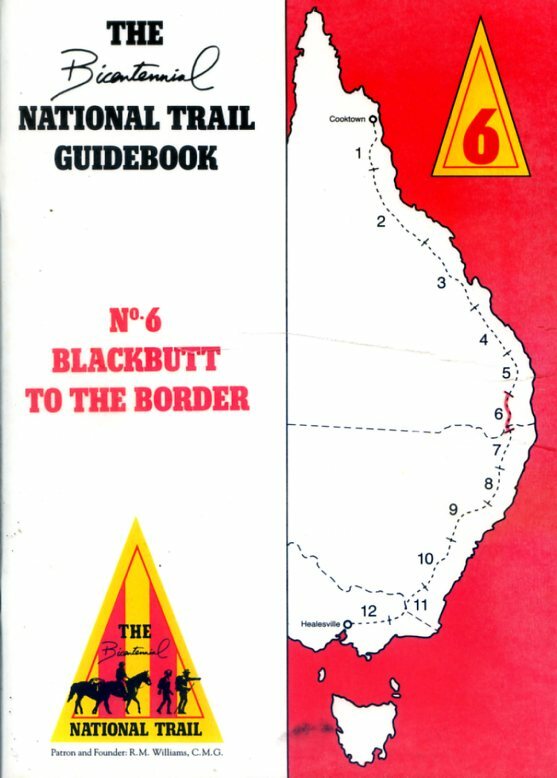 Guidebooks seven to eleven are for travel through New South Wales and the ACT. If you want the ACT – it is covered in Guidebook 10.